There are already several manufacturers that have opted to integrate Amazon’s virtual assistant Alexa in their cars. 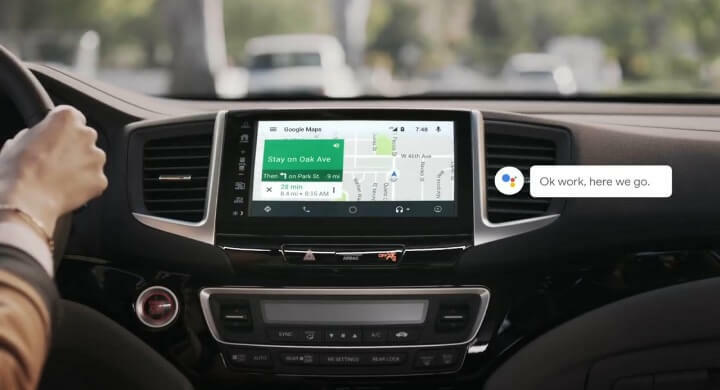 Now Google also wants to provide its own version of what should be a voice control interface with the car and has launched its own Android Auto assistant. The company has released an update of this application in the United States in which already includes its assistant. From now on, drivers who have downloaded it can ask their car how to get to a place, ask them to remind them of their agenda or to play a song. They can even use the Google assistant to send or receive messages through services such as WhatsApp or SMS messaging. There are already several assistants available that can be controlled from the car, Apple also has his own thanks to Siri. Now companies compete to get the assistant that offers more and better services. For its part, the new assistant Google assistant will allow in the future to place orders through the voice commands in the car. For example, they can place an order at a cafeteria or restaurant while they are driving, and then pick it up in person. Of course, only this type of orders can be made to establishments that have been associated with the application. In the presentation of its assistant, Google added that they are working with car brands to integrate directly into the multimedia systems of their next models. We have already seen some progress with the Volvo-Google multimedia system. This way it will not be necessary to connect any smartphone to the vehicle through the Android Auto application, but it will be a car’s own function. Both Google and Amazon are making efforts to secure a position in the world of technologies related to the automobile. Their voice-controlled assistants are only a small part of the projects that they are developing. They cover all kinds of technologies such as autonomous driving, with Google Waymo cars; electric vehicles, with the drone to charge batteries patented by Amazon, or the sale of cars over the Internet.